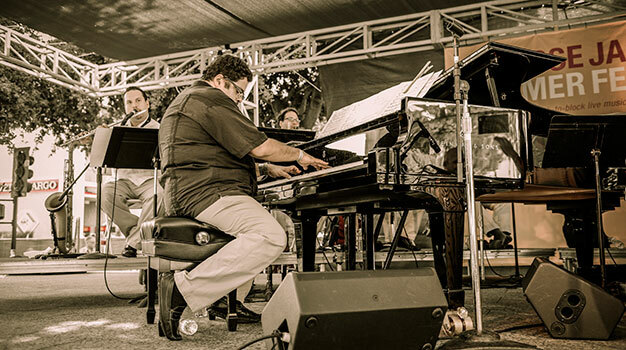 Founded in 1986, San Jose Jazz is a public benefit corporation celebrating jazz as a dynamic, evolving art form and is producer of the annual San Jose Jazz Summer Fest and Winter Fest. With its singular music programming and innovative educational offerings, San Jose Jazz preserves the jazz tradition while actively supporting the next generation of performers within the genre and beyond. San Jose Jazz is live music. Established international stars. Emerging artists. Local and regional players. San Jose Jazz presents great live music! With over 100 performances on 13 stages in 3 days, Summer Fest is one of the Bay Area’s biggest music festivals. Held in March, Winter Fest presents diverse artists that push the creative envelope. In addition to the two annual Fests, San Jose Jazz programs various events in the downtown area throughout the year. The new SJZ Boom Box is a mobile venue, designed to bring jazz concerts to neighborhoods throughout the Bay Area. San Jose Jazz is music education. San Jose Jazz benefits thousands of children per year through its year-round, high quality, youth education programs and commitment to providing performance and classroom opportunities for students. The organization’s highly-regarded programs include Progressions, a research-based youth development program that uses music to connect with low-income, at-risk students. The High School All Stars program is a regional, audition-based big band for talented young players. Our large ensemble and small combo play high-profile gigs all over the region. Summer Jazz Camp connects talented middle and high school students with the Bay Area’s best music teachers for a life changing, two-week learning lab. The Next Gen Stage at Summer Fest provides students with opportunities to perform alongside internationally acclaimed artists.